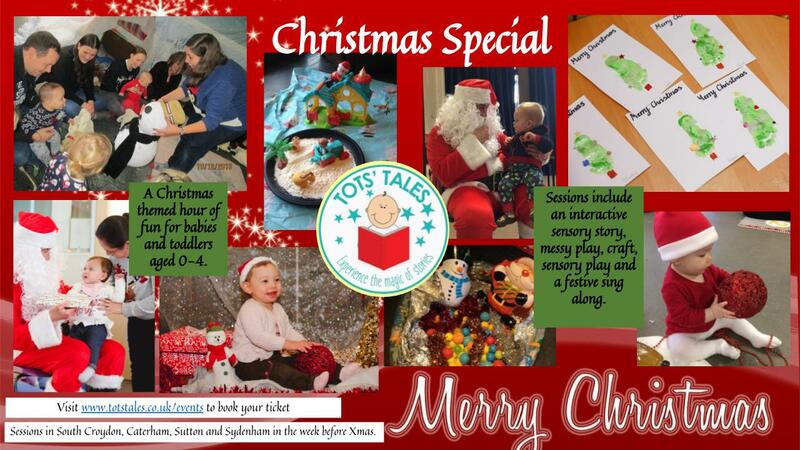 A Christmas-themed event for babies, toddlers and preschoolers aged 0-4 years. Sessions last one hour and begin with a themed sensory story, brought to life with props and more. We will then have time for sensory and messy play and craft activities with artwork to take home as a keepsake. The session will then finish with a visit from Father Christmas and a festive sing along. The price for one child ticket is £10. We offer a reduced price for siblings of £8 per ticket. Spaces are limited so purchase your ticket early to avoid disappointment! Wednesday 19th December 2018, 2.15- 3.15pm @ St Augustines Church, St Augustines Avenue, SOUTH CROYDON FULLY BOOKED! Thursday 20th December 2018,2.15- 3.15pm @ Caterham Children's Centre Pavillion, Guards Avenue, CATERHAM FULLY BOOKED! Thursday 20th December 2018, 3.30- 4.30pm @ Caterham Children's Centre Pavillion, Guards Avenue, CATERHAM FULLY BOOKED! Complete the form below to book your ticket. Session sold out? Join our waiting list! If the session that you were hoping to attend has sold out, please leave your email address below to join our waiting list- you will be contacted in the event of cancellations. Enter your email address below to be notified about our Valentines Special when tickets go on sale!